Photomatix, by HDR Soft, has recently updated their show-stopping HDR software from 4.1.4 to 4.2.1 and I must say, they added some very nice features. Photomatix creates impeccable HDR results in almost any tone mapping circumstance; I would expect nothing less from the release of 4.2.1. With the new release comes a slightly new look and a few new features. You can see the full list of new features here. The addition of finishing touches is very welcomed in the new release. 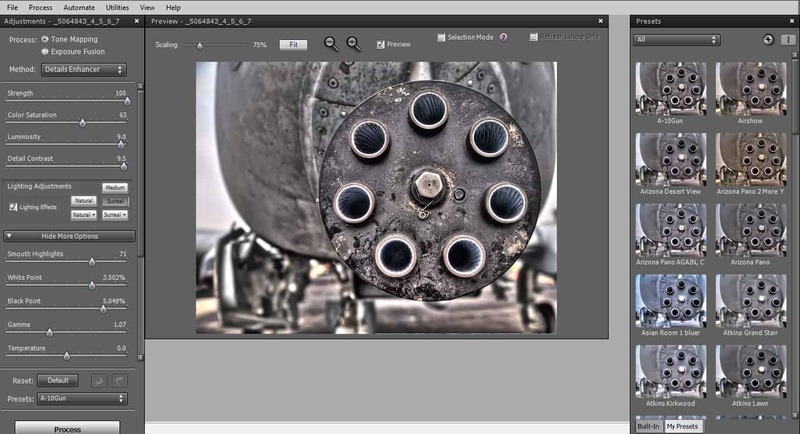 HDR Soft has included three very helpful Finishing Touches that can be applied after the image has been tone mapped making Photomatix very close to being a stand-alone HDR tone mapper and post processor. These touches include Contrast, which is controlled very similar to “Curves” in Photoshop, Color, which allows one to control the saturation of individual colors, and Sharpening. 20 new Presets are included in the new version. In the past the presets always frustrated me as they were not very helpful for creating a desirable product. HDR Soft has greatly refined their presets and has also included a category system for them. Another great preset feature is the ability to list your presets in not only a single column, but a double column. As always the quality of the image Photomatix produces is bar nun! HDR Soft keeps getting closer and closer to what I would love in their product. They added the finishing touches, which I think are a great addition, but I would really like to see those finishing touches added to the tone mapping phase. There would be a much higher level of control over the final image if these were included in the tone mapping and not as a finishing touch. I have always been a firm supporter of Photomatix Pro. I have processed over 2000 images in Photomatix and find it to be my HDR Software Program of choice. Would I recommend it to a friend? I would recommend it to anyone even considering getting into HDR photography. It can be a little rocky at the start, while the user interface is pretty intimidating, with a little bit of reading, the beast can be tamed!